Do you have a hot and dry yard? Have problems with growing plants? 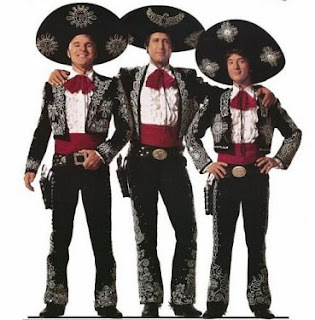 Then I have a solution for you, the Three Amigos. Wherever there is garden injustice, you'll find them. Wherever there is suffering, they'll be there. Wherever liberty is threatened, you will find..... well not quite! If summer is your 'El Guapo', then these "three amigos" are here to help. 1. 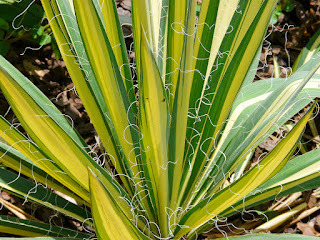 Yucca 'Color Guard'. This one is from the Adam Needle types (Y. filamentosa), one of the most commonly found in the trade. 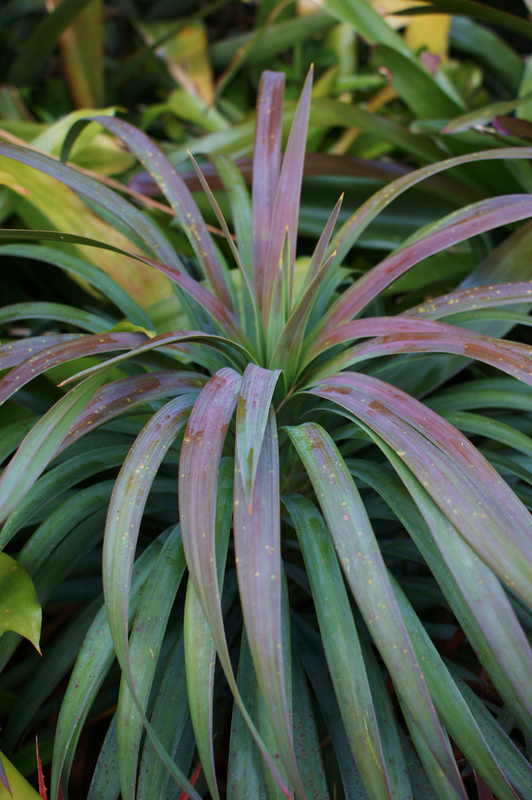 Variegated versions have been around for awhile, this cultivar is truly the most exceptional gold-centered yucca on the market. The evergreen foliage is covered in filament hairs that curl off the edge of a bladed leaf, but can be cleaned off if preferred. Over time it forms an upright and arching mound that increases its beauty in the border, year after year. In summer, the creamy white bell shaped flowers hang from a tall, sturdy spike and open at different intervals, keeping the flowers fresh for many weeks. Eventually, the rosette where the flowering spike came from will die (monocarpic), but is replaced by young shoots that are produced around the base of the 'mother' rosette to replace its loss. Clumps can reach up to 3ft across, but can be lifted and divided, with little effort if needed. Zones 5 - 10. Yuccas make excellent container plants or planted as to create a strong architectural focal points in the garden. Successful once established, in the harshest parts of the garden, from droughts to prolonged sun exposure, and fully deer resistant. In the wise words of Steve Martin character, 'Lucky Day', "In a way, all of us have an El Guapo to face. For some, shyness might be their El Guapo. For Others, a lack of eduction might be their El Guapo. For us, El Guapo is a big, dangerous man who wants to kill us." We gardeners can conquer our El Guapo and produce a beautiful garden in summer by planting wisely and selecting any one of these "three amigos"! I would add three alternative amigos: little bluestem, nepeta, and any number of sedums. I always feel sorry for the under dogs, everyone overlooks Yucca's probably because of the spear tipped leaves, but you could have an army of amigos to write about if you're not careful. Very nice blog you have! Just included it to my blog roll to follow. Thanks for writing. You've written about 3 of my favorites! 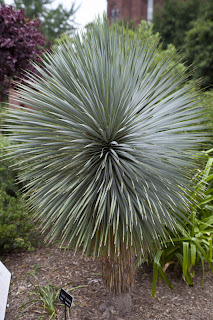 Yucca 'Color Guard' does very well in my Portland, Oregon, (zone 8) garden. As does Yucca rostrata. I'm afraid however that Yucca aloifolia 'Purpurea' hasn't been so successful. I had 7 of them at one point but have ripped out 3, the other 4 struggle on...if I weren't so lazy about it they would probably be gone too! Sad to hear that y. 'Purpurea' didn't survive for you. I just saw them for the first time last week on a nursery trip down to Norfolk, Virginia. It was new for them, but they thought it might work for us a little north. However, they're on sandy soil with good drainage and up here it the thick yellow clay! Might have to rethink! Thanks for the heads up. All of those are a bit too stabby for me. I would need to garden in chain mail. I prefer sedums, liatris, annual vinca, lantana, nepeta, orange milkweed, or ironweed. It's not a bed in the garden center I look forward to working in, but they are alluring in a strange way. Compare it to the 'REAL' hot wings at Buffalo wild wings, you know you shouldn't, but curiosity gets the better of you. Danger is my middle name. Do you all get in bare root peonies in the fall? I am looking for Coral Sunset, want to know if I need to order online or if I can get them locally. Thanks!